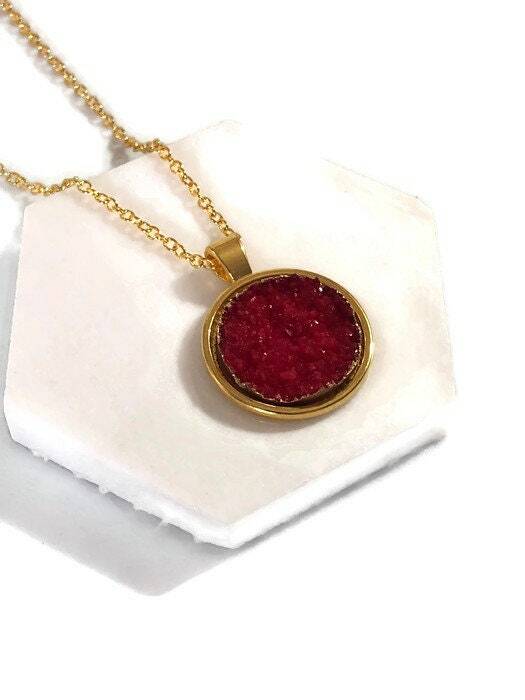 The Drew Necklace is a large druzy pendant set in a bezel. Each one is lightweight, eye catching, and easy to wear! Hitting right at the collarbone, Drew is the prefect necklace to go from day to night. We have had the unique opportunity to travel the world in the past decade. From the salty coast of Maine, to the tropical island of Okinawa, to the Southern sweetness of Georgia, to the towering and gorgeous mountains of Utah, to the trendy old town of Washington, DC. We have implemented techniques and styles that we loved in each location, and have brought to you a cohesive and unique collection of pieces. We want to bring you the best pieces that are available, while still remaining affordable!